Today marketing and promoting your business or corporate brand with advertising merchandise in Australia is foremost to successfully building your business success. At Coastal Direct Promotional Products we take note! Keeping up with latest and greatest, new and innovative branding techniques made available to enhance your branded company merchandise to the highest possible professional appearance. Designing the look and feel of your branded merchandise is just as important as your logo design itself, adding texture, raised designs or crisp clean full colour can be fully achieved with solutions for marketing your company merchandise, advertising merchandise and campaign event personalised products. Choose the right branding! Consider your logo in full colour or single colour options, what gives the most impact or desired effect? “MIX it UP” Advertising Merchandise in Australia can now have the options of Supasub full colour sublimated patches with an embroidery edge. Supaetch laser etch your company or corporate design into contrasting leather suede patches with an embroidery edge providing the high end luxury feel for any corporate gift or bag. Don’t shy away from digital transfers! Today’s high tech transfers such as Supacolour are made to last! photo quality finishes, high flexibility and wear resistance suitable for all business and company merchandise, workwear, bags, hats and allot of marketing merchandise like compendiums and so forth. Traditional printing solutions on a wide variety of advertising pens, advertising notebooks and advertising novelty gifts providing full colour digital printing, multi-colour or single colour branded techniques. Contact Coastal Direct today for your company marketing merchandise in Australia, advertising merchandise and conference merchandise. Supacolour is the latest technology in digital reproduction of logos. It is a proprietary technology that is exclusive to Epicentre Range, and in just 5-7 days from artwork approval to dispatch, it is very fast. It can reproduce logos perfectly without a need to compromise. Robust! Can be applied across seams and on coarse fabrics. 100+ washes, will outlive the product and won’t peel, crack or fade. Supasub is a proprietary technology that is exclusive to Epicentre Range, perfect for when the detail in a logo can’t be reproduced with embroidery but you still want the look of embroidery. Supasub is perfect for products where Supacolour isn’t viable like beanies and scarves. Supasub gives fantastic detail, vibrancy and quality but the embroidered edge offers a real point of difference – essentially it’s the best of both worlds! Supasub is a fast turnaround in just 5-7 days from artwork approval to dispatch. What are the benefits of using Supasub? Supaetch is a new on-trend decoration method at the moment. The laser-etched suede patch is laser-cut then over locked onto a range of products like, headwear, bags, blankets, beanies and scarves. The stylish finish is subtle yet effective, showcasing both the product and your brand in a professional manner with a high perceived value. Exclusive to Epicentre Range. It is available in 11 different colour suedes and with the ability to select either a contrast stitch or a matching stitch, the colour is your choice. This provides you the ability to customise the finish to suit the product and logo perfectly. 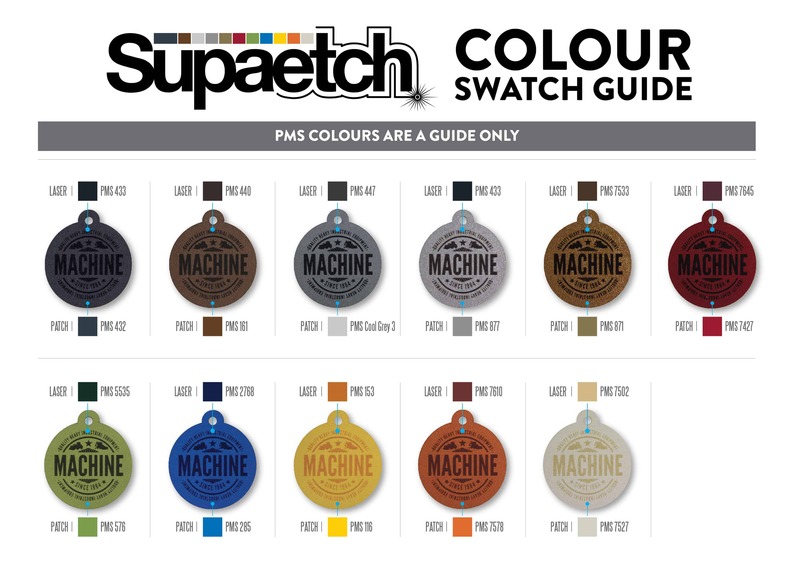 Supaetch offers a fast 5-7 day turnaround from artwork approval to dispatch. Photo quality images and graphics printed directly onto a broad range of products using specialist uv inkjet printers, producing spectacular full colour results. Digital printing refers to methods of printing from a digital-based image directly to a variety of products, its usually printed using large-format and/or high-volume laser or inkjet printers. It also allows for on-demand printing, short turnaround time, and even a modification of the image (variable data) used for each impression. The savings in labor and the ever-increasing capability of digital presses means that digital printing is reaching the point where it can match or supersede offset printing technology’s ability to produce larger print runs at a lower price in full colour. Four colour process (CMYK) artwork required – white ink is laid down as a 5th colour if needed. Machine embroidery is an embroidery process whereby a sewing machine or embroidery machine is used to create patterns on textiles. It is used commercially in product branding, corporate advertising, and uniform adornment. Hobbyists also machine embroider for personal sewing and craft projects. There are multiple types of machine embroidery. These include free-motion sewing machine embroidery, this uses a basic zigzag sewing machine. Much commercial embroidery is still done with link stitch embroidery the patterns may be manually or automatically controlled. More modern computerized machine embroidery, uses an embroidery machine or sewing/embroidery machine that is controlled with a computer that will embroider stored patterns, these may have multiple heads and threads. Sharper imprint than pad printing, but it requires a relatively flat surface without obstructions. Screen printing is also a stencil method of print making in which a design is imposed on a screen of polyester or other fine mesh, with blank areas coated with an impermeable substance. Ink is forced into the mesh openings by the fill blade or squeegee and by wetting the substrate, transferred onto the printing surface during the squeegee stroke. As the screen rebounds, away from the substrate the ink remains on the substrate. It is also known as silk-screen, screen, serigraphy, and serigraph printing. One color is printed at a time, so several screens can be used to produce a multicolored image or design. There are various terms used for what is essentially the same technique. Traditionally the process was called screen printing or silkscreen printing because silk was used in the process prior to the invention of polyester mesh. Give your image a clean, polished appearance. Light burns an image into a substrate. Laser engraving, is the practice of using lasers to engrave an object. Laser marking, on the other hand, is a broader category of methods to leave marks on an object, which also includes color change due to chemical/molecular alteration, charring, foaming, melting, ablation, and more. The technique does not involve the use of inks, nor does it involve tool bits which contact the engraving surface and wear out, giving it an advantage. The impact of laser marking has been more pronounced for specially designed “laserable” materials. These include laser-sensitive polymers and novel metal alloys. Works best when the item’s surface is a different colour than the substrate. A contrasting black imprint can be created with Laser Oxidation when the surface and the substrate are the same colour. Pad printing is a printing process that can transfer a 2-D image onto a 3-D object. This is accomplished using an indirect offset printing process that involves an image being transferred from the photo-etched plate via a silicone pad onto a substrate. Pad printing is used for printing on otherwise difficult to print on products in many industries including medical, automotive, promotional, apparel, and electronic objects, as well as appliances, sports equipment and toys. The pad can wrap itself as much as 180° around a small object, and ink coverage is excellent. An image is etched onto the surface of a metal plate and filled with ink. The paper/substrate is pressed against the inked plate, transferring it to the material. One of the most important functions in the printing process is prepress production. This stage makes sure that all files are correctly processed in preparation for printing. This includes converting to the proper CMYK color model, finalizing the files, and creating plates for each color of the job to be run on the press. Roll Printing is a screen print method used for printing around curved items (i.e pen barrels and drink bottles). The item being printed moves along a conveyor belt and is rotated under a mesh screen at the same speed as a squeegee runs over it, thus transferring the design onto the item. Roll Printing provides solutions in container & bottle screen printing with both fully automatic UV screen printing machinery and semi-automatic screen printing machines for screen printing onto round, square & oval bottles. Plastic and glass containers of all types can be screen printed. Products such as; poly bottles, single & double wall jars, wine bottles, beer bottles, reusable powder coated and SS water bottles, PE, bike water bottles, PE thermos jugs, coffee mugs and much more are all well suited for direct screen printing. Custom orders can also include having your design die cut to suite your design / logo. Car fresheners or key rings, can be made to order indent with a die cut to suite your logo shape. This service is available for 1000 units and up on this product. Wish to have custom colour products to enhance and match your business. This is a great way to have a one off that no one else has. This service is available for pens – 10,000 units and up. A lot of other products – 1,000 units and up. Indent your order to suite your logo / business colours.